The handsome black and tan terrier of Wales, the Welsh Terrier is a smart and sensible member of the terrier family who offers owners charm and personality in abundance. Like their loyal, fearless hunting dogs, Welsh Terrier owners are strongly devoted to their happy, responsive dogs. For an experienced dog person, the Welsh is biddable and obedient, though, for the novice, the breed may be too bright (or stubborn) to handle. This is a practical companion dog looking for a like-minded owner to appreciate all his vistures. Welsh owners think as highly of their dogs as the dogs think of themselves! Blessed with a strong constitution and hardy health, the Welsh promises many quality years for the right dedicated owners. 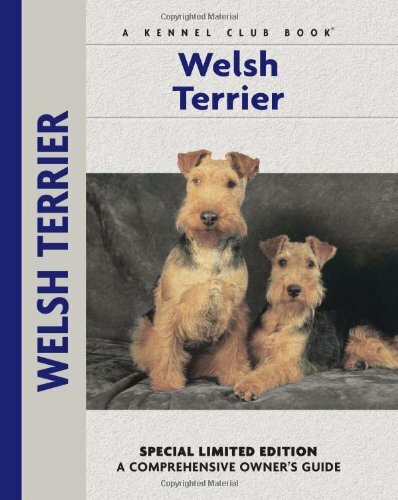 Written by long-time Welsh Terrier breeder and popular author Bardi Mc Lennan, this new Special Limited Edition offers an insightful look at the breed’s history and origins, the Welsh’s characteristics and breed standard as well as comprehensive coverage of puppy selection, care and training. All aspects of care are included in this new colorful volume, including house-training, grooming, feeding, home safety and healthcare. The book also presents a special chapter on recognizing and solving behavioral problems and introduces Norwich lovers to the exciting world of competitive pure-bred dog sports. If you have any questions about this product by Brand: Kennel Club Books, contact us by completing and submitting the form below. If you are looking for a specif part number, please include it with your message.